Henry’s Fence Company will ensure that your commercial fence is properly installed and sturdy enough to last for years. 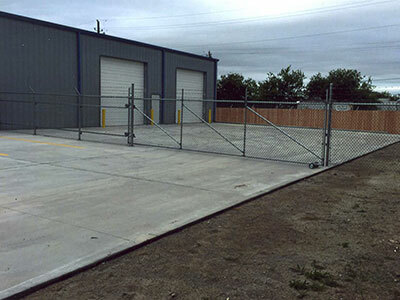 We are experienced in a wide range of commercial fencing and industrial applications. We have worked with many businesses to deliver commercial fences that meet their functional, security, and image-related goals. Our commercial fences may be constructed of a wide range of designs, in aluminum, PVC vinyl, chain link, wood, or a combination of materials. We can handle everything from light commercial to heavy industrial jobs. Whether you’re looking to increase value, heighten aesthetics, or protect and secure your business—our commercial and industrial fencing experts will manage your project with the highest level of professionalism and customer service. 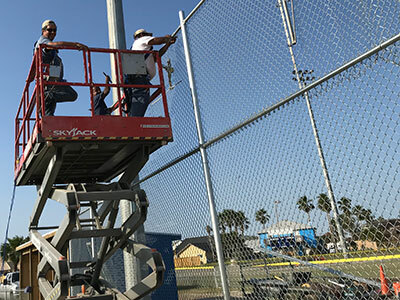 Our satisfied customers include parks and athletic facilities, storage facilities, office buildings, construction sites, and local businesses. Privacy and security are the main reasons businesses build fences, but they can also enhance the image and public face of your business. We offer many attractive fence options that will complement your property, while safeguarding operations. View our commercial fence galleries below to see examples of fences built for municipal and water utilities, electric substations, educational/recreational fences, warehouses, distribution centers, and sports facilities. Our commercial fences are always made from the highest quality of materials. We do not cut corners to reduce prices because we know that lower quality materials give you a sub-par product that will not last as long as a well-made product. The materials chosen for commercial fences often reflect the neighborhood and areas surrounding your business. Metal fencing is the most popular choice for city-based companies, while rural business owners might opt for a rustic look, such as split rail fence. Another popular choice, is PVC vinyl fencing because it maintains an attractive sheen with little-to-no maintenance. We make commercial fences from a number of different materials and in a wide array of designs and styles. Location often determines the materials, but the functions of your fence (security, privacy, aesthetics) also play a role in selecting the type of fence you need.